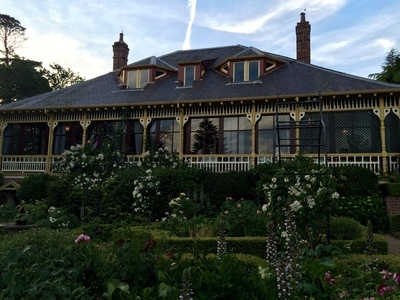 View of Darley's restaurant from the garden. 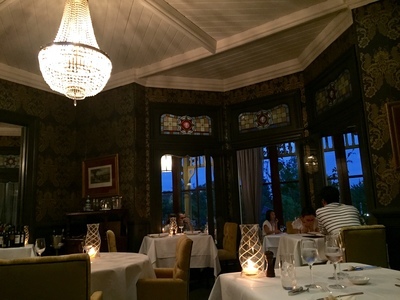 Darley's is an award winning, Hatted, restaurant located in the heights of Katoomba and part of the stunning Lilianfels Resort and Spa. The restaurant has a regal Victorian feel with extravagant crystal chandeliers, leadlight windows and two ornate open fireplaces. It also boasts incredible views of the Blue Mountains. The Gatsby-esque feel is accentuated by classic 1920s American jazz music which wafts in the background. Cucumber jelly with fresh dill mayonnaise and topped with smoked ocean trout. Upon arrival we were served a complimentary appetiser. 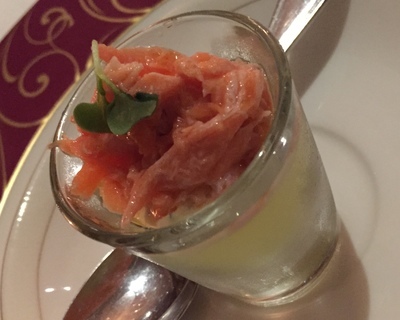 The server informed us that this was cucumber jelly with fresh dill mayonnaise, topped with smoked ocean trout. Certainly an interesting combination to start the night off and a mix of textures for the palate. We were also served fresh sourdough bread from a local Katoomba bakery accompanied by rosemary salted butter. 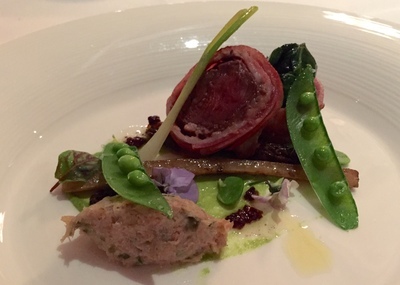 Kangaroo wrapped in pancetta, parsley cream, purplette onions, rillet, morel, broad beans and baby spinach. I ordered the ballotine of rabbit wrapped in pancetta, but was disappointed to find that it had been replaced by kangaroo for the evening. Fortunately, the kangaroo was beautifully cooked and the pancetta complimented the flavours of the dish perfectly. The broad beans were nicely presented and added an extra element of freshness to the dish. 62 degree soft cooked organic duck egg, smoked ham hock, pea puree and shaved asparagus. 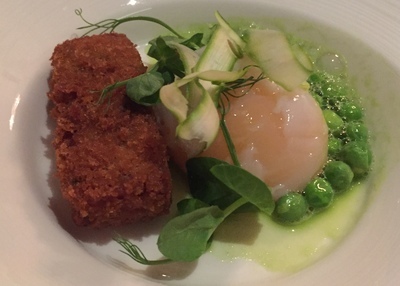 My partner ordered the soft cooked duck egg with smoked ham hock, pea purée and shaved asparagus. The combination of flavours made this dish taste almost like a very sophisticated pea and ham soup. I could have happily eaten this as a main and been quite satisfied. Kanimbla Valley lamb loin, cannelloni of braised lamb belly, salt brush and almond eschalot crumb, smoked carrot juices and local heirloom baby carrots. There was quite a long delay between meals, but when the mains did arrive they were well worth the wait. I ordered the Kanimbla Valley lamb loin and my partner had the roast loin of pork. 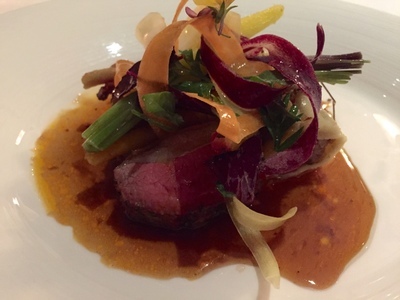 The lamb loin was tender, but the cannelloni of braised lamb belly was the star when it came to the mains. The plate was decorated with heirloom baby carrots, which were sourced locally, and a drizzle of smoked carrot juices. Roast loin of pork, confit belly, maltose crackling, apple, textures of artichoke, currants, kabu turnips and port jus. The loin of pork was equally as impressive, with turnips, currants and artichokes, and a small cut of melt- in-the-mouth crispy skinned pork belly soaked in a port jus. By this stage of our meal we were beginning to get quite full. 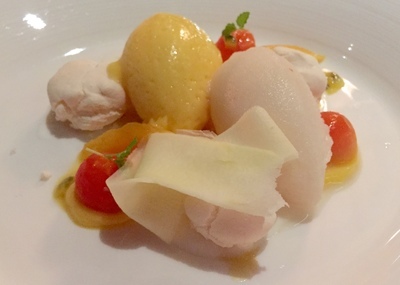 Mango and lychee sorbets, crisp meringue with passionfruit curd, pickled green mango and fresh paw paw. A selection of innovative dessert options made choosing just one particularly difficult. My partner wanted something a bit more simple, so she opted for the roasted macadamia nut ice cream without all the extra trimmings. I wanted to be a bit more adventurous and ordered the mango and lychee sorbets which were accompanied by crisp meringue with a gooey passionfrut centre and dotted with fresh paw paw. Visit Darley's for the spectacular views, innovative dishes and overall look and feel. Just be prepared to spend around two hours there if you're having the three course meal. Cost: Darley's offers 2 and 3 course meal packages from $95 p.p. Sides are an additional $12 each.